Set Email Templates on the Webstore. 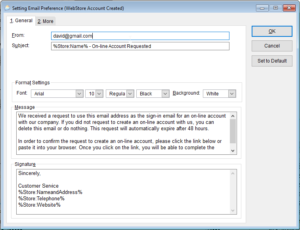 In the WebStore there are options to set different email templates that will be sent upon completing certain actions in the WebStore. 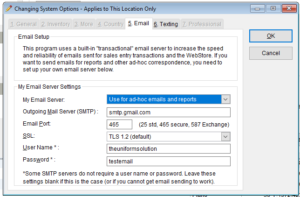 In order to access the email templates you will first go into your Webstore Configuration. 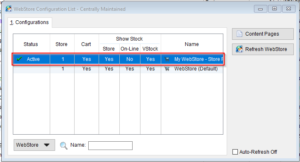 Once in your Webstore Configuration, double click into your active Webstore configuration. In your Webstore configuration, you want to go into Email. 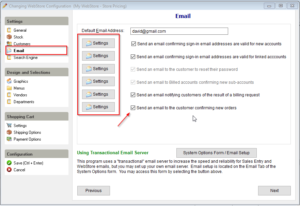 From here you can set you email templates by selecting the Settings button, and choose whether or not you want an email sent for specific actions by checking or unchecking the boxes next to the description. To edit your email template click into Settings. Here you will be able to edit the template along with choosing whether or not to receive a copy for yourself, or add and image file to the email. In order to send a copy to yourself or attach an image to the email, you will go into the 2. 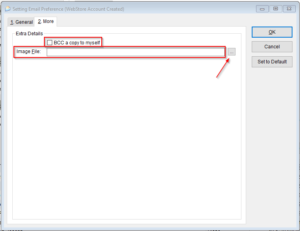 More tab and choose to either “BCC a copy to myself” or attach an image using the ellipses next to “Image File“. 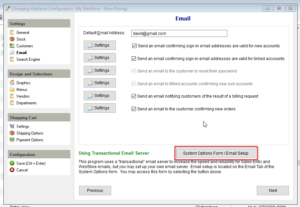 To check your email settings as set in The Uniform Solution, click into “System Options Form/ Email Setup” in your Email section of your webstore configuration. This information can also be found in The Uniform Solution by going in Setup> System Options> 5. Email tab. How Do I Add Third Party Billing on the Webstore?